Adapted with permission from Ghosh AK et al. Angew Chem Int Ed. 2012;51:1778-1802. References: 1. Diernyck I, De Wit M, Gustin E, et al. Binding kinetics of darunavir to human immunodeficiency virus type 1 protease explain the potent antiviral activity and high genetic barrier. J Virol. 2007;81:13845-13851. 2. Ghosh AK, Anderson DD, Weber IT, Mitsuya H. Enhancing protein backbone binding—a fruitful concept for combating drug-resistant HIV. Angew Chem Int Ed. 2012;1778-1802. 3. King NM, Prabu-Jeyabalan M, Nalivaika EA, et al. Structural and thermodynamic basis for the binding of TMC114, a next-generation human immunodeficiency virus type 1 protease inhibitor. J Virol. 2004;78:12012-12021. 4. Tremblay CL. Combating HIV resistance—focus on darunavir. Ther Clin Risk Manag. 2008;4:759-765. 5. 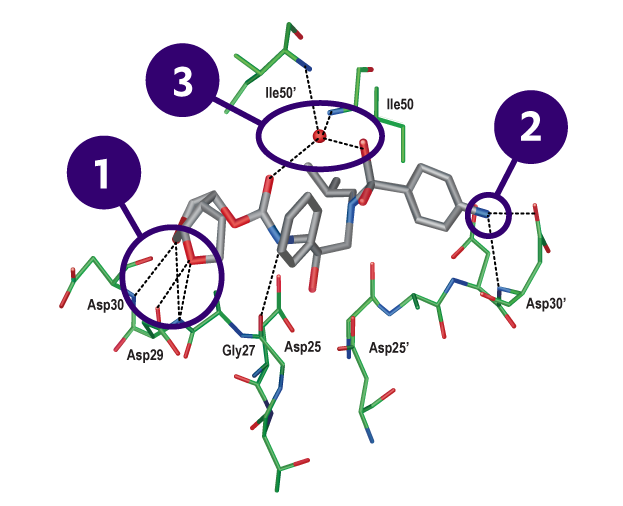 Ghosh AK, Chapsal BD, Weber IT, Mitsuya H. Design of HIV protease inhibitors targeting protein backbone: an effective strategy for combating drug resistance. Accounts Chem Res. 2008;41:78-86.